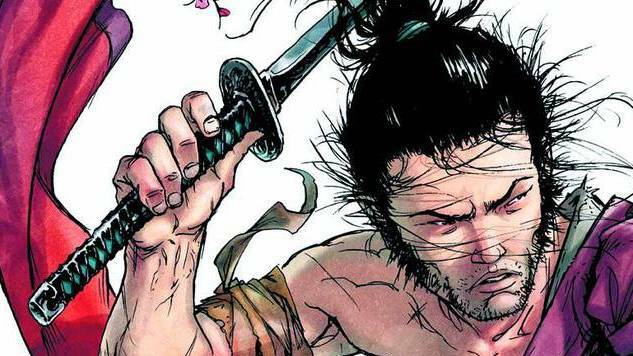 The first issue of Samurai: The Isle With No Name offers a stylized slow burn that befits its protagonist, Takeo. In an introductory page of text that brings readers up to speed with the character—he’s occupied nine previous volumes since 2009—we learn that Takeo’s sword “cannot be sheathed until blood is spilled.” This development leads to a contradiction at the heart of the book: while it abounds with action and intrigue, its protagonist is reluctant to slaughter his adversaries in combat. But that wrinkle allows creators Jean-François Di Giorgio and Frédéric Genet to devise infinitely more interesting fights for their hero, rather than simply pitting him in brutal acts of violence. As first issues go, this debut is more of a narrative seed than a self-contained tale: Di Giorgio sets plots in motion and introduces characters, but resolves little by the last page. Thankfully, the issue establishes enough intrigue to drive readers to next month’s chapter. Takeo ventures to the titular island in hopes to find his brother; the area also hosts an annual battle between a champion representing the islanders and one from a group of area yakuza. Shobei, an older samurai acquainted with Takeo’s mentor, makes his introduction, and is much more willing to shed blood when confronted. Shobei’s backstory is a tragic one, both in terms of the fate of his family and the clash between his abilities as a fighter and his desire for death; he eyes Takeo as his opponent in the annual battle, serving as a moment of not-especially-subtle foreshadowing. Di Giorgio’s plot and script, although dealing largely in archetypes, creates a number of morally grey sequences. The islanders are sympathetic, but some are willing to engage in unethical acts in the hopes of winning their annual battle. Shobei falls in the service of unsavory characters, but his brutal past rationalizes much of his trajectory. That handling of archetypes seems intentional, however; the storyline plays out like a knowing remix of tropes and prototypes. The title also provides an interestingly circular series of references. This is a French comic about a Japanese samurai; the title evokes Clint Eastwood’s character in Sergio Leone’s Dollars trilogy, the first of which was inspired by Akira Kurosawa’s Yojimbo—the main character of which was a masterless samurai. The combination of Genêt’s artwork and Delphine Rieu’s colors make for a number of evocative settings and sequences, from a sneak attack on a docked boat, to Takeo making his way across the island on a dark night. And, as befits a story about a samurai, the action sequences are handled neatly and creatively, giving a suggestion of Takeo’s skills, as well as his restraint. There’s plenty to find compelling in this book, even as the larger picture of The Isle With No Name remains untold.